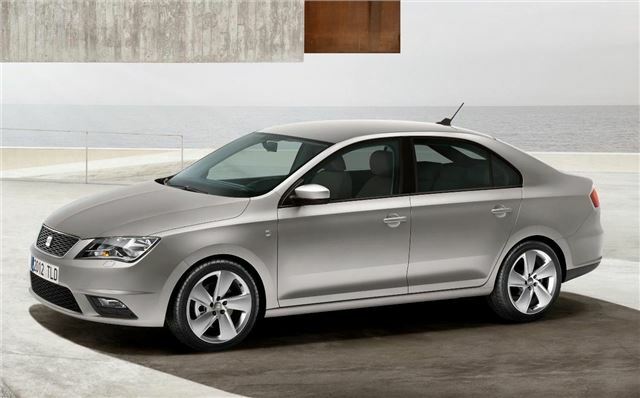 SEAT’s new small saloon will go on sale in the UK in 2013. Called the Toledo, the new car should start at between £13,000 and £14,000, although prices have yet to be finalised. Despite the Toledo’s saloon car profile it is, in fact, a hatchback, which should make it a more popular choice in the UK, where saloon models tend to be less popular than they are on the continent. 1.2 and 1.4-litre TSI petrol engines will be offered, along with a 1.6-litre TDI diesel. Power outputs for the petrol engines range from 75PS to 122PS, with emissions of 116g/km for the cleanest Ecomotive variant. The diesel will initially be offered with 105PS and emissions of 104g/km, but a 90PS engine will join the range later. A DSG automatic gearbox will be offered with the more powerful petrol engines. The styling is fairly sober, with a traditional saloon silhouette, although SEAT touches to the grille, headlights and tail lights liven things up a little. The cabin is similarly understated, with a traditional, practical design. There’s a relatively long wheelbase of 2602mm, so rear legroom should be good, as should rear loadspace. Final specifications and prices will be announced closer to the car’s UK introduction in 2013. I love the leather seats, it screams "class". Definitely one of the better cars that I've seen as of late.